Can there be anyone reading this who does not know Terry Gilliam's fabulous fantasy Time Bandits? Just in case there you're somehow new to the film, it's the story of young Kevin, whose bedroom is one night invaded by a fractious group of time-travelling dwarfs (led by the late David Rappaport), whom he accompanies as they jump through the centuries to meet a perennially grouchy Napoleon Bonaparte (Ian Holm), a Prince Charles-like Robin Hood (John Cleese) and a heroic Agamemnon (Sean Connery). All of which lands him in the middle of a battle between Evil (David Warner) and the Supreme Being (Ralph Richardson). 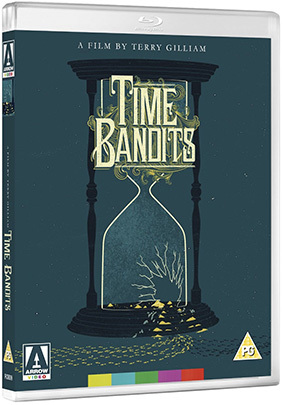 A gloriously imaginative fantasy like no other youre ever likely to have seen, Time Bandits is one of Gilliam's most remarkable and endearing achievements, and boasts a cast to die for, the above listed stars above backed by the likes of Shelley Duvall, Katherine Helmond, Michael Palin and Peter Vaughan. Time Bandits has already had a couple of DVD and one Blu-ray release and none of these were close to pristine. Hopes are high for this edition, a brand new 2K resolution restoration from the original camera negative, approved by Terry Gilliam. The new digital print will be screened in selected cinemas from 9th August 2013 and on UK DVD and Blu-ray on 26th August 2013 by Arrow Video at the RRP of £15.99 each for the DVD and the Blu-ray and £17.99 for the steelbook edition.